The characters of My Little Pony: Friendship Is Magic grace us with lessons of care and compassion just as frequently as they bless us with new DVDs. 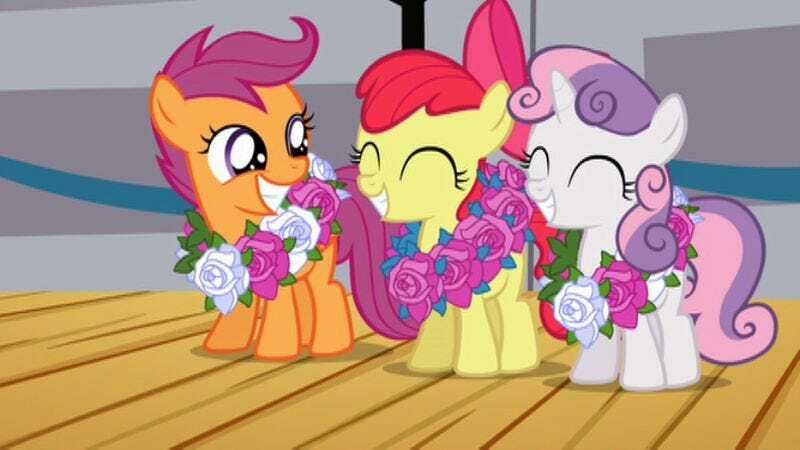 On Tuesday, the ponies of Equestria unleashed Adventures Of The Cutie Mark Crusaders, a new DVD collection of favorite episodes from Hasbro and Shout! Factory Kids. And, because one medium is never enough to contain the magic of friendship, the fun continues on the new interactive storybook app, Cutie Pox. The A.V. Club knows it can be a lot for a Brony to handle, so we’ve got an opportunity for you to make the new DVD and app yours for free. We’ll select one winner to receive a copy of the Adventures of the Cutie Mark Crusaders DVD as well as a free Apple download of the new Cutie Pox storybook app. Additionally, two runners-up will receive their own copy of the Adventures of the Cutie Mark Crusaders DVD. For your chance to win, simply send an email to avcontests@theonion.com with the subject line “Friendship Is Magic.” Be sure to include your name and mailing address in the body of the email. Winners will be selected at random from eligible entries on Thursday, March 5 and notified shortly thereafter. Estimated retail value of the prize is $14.99. An official clip from the DVD release can be found below.